The Surgical Operating Microscope not only helps with locating and treating canals (primary endodontic anatomy), but it can also be a useful tool for locating and treating secondary endodontic anatomy. 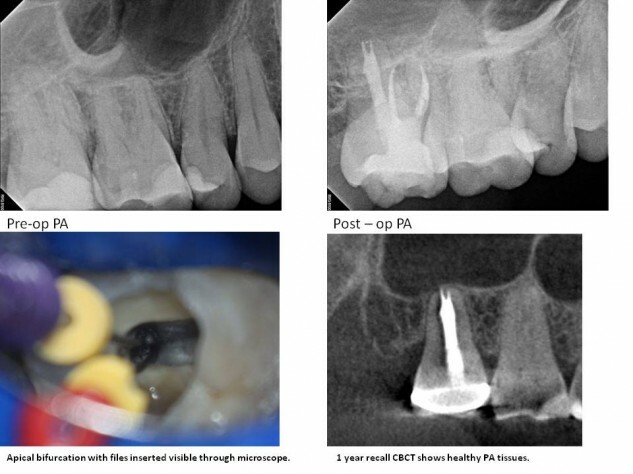 The case below demonstrates a deep apical bifurcation in the palatal root of # 2. This root was relatively straight, allowing for direct visualization of the bifurcation with the magnification and co-axial lighting provided by the SOM.